Evening's Empire, a Doctor Who comic strip from the 1990s written by Andrew Cartmel, was never completed in the pages of Doctor Who Magazine. Although a version was printed subsequently, this new collection contains the first publication of the full story as originally intended, with brand-new artwork from the original artist, Richard Piers Rayner. 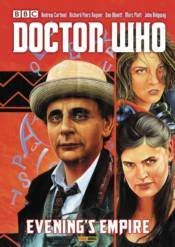 This volume collects together comic strips featuring the seventh Doctor and Ace, as played on television by Sylvester McCoy and Sophie Aldred. DOCTOR WHO: ESSENTIAL GUIDE REVISED - 12TH DOCTOR EDITION DOCTOR WHO: FEAR OF DARK 50TH ANNIVERSARY ED.